I had a quick trip out of town last week to attend a conference for work. Choosing books for traveling is always a challenge for me because I want to bring my whole collection and not be limited in choices when I have to pick a new read. Most of the time, though, I don't actually finish books on trips. This was the exception. I started a fantastic book the day before I left and finished it my second night in the hotel. Then I was able to read a second book at the airport waiting for my flight (long wait would have been infinitely more torturous without a book). I figured, what with Dreadnought due out and my luck with Boneshaker on my last work flight, that Clementine would be a good one to bring along with me. And I was right! It got me clear through my gap between our event and my plane trip home. Readers of Boneshaker might remember Captain Croggon Beauregard Hainey. In Clementine, he's chasing down the thief who stole his dirigible, Free Crow. Meanwhile, Belle Boyd, an ex-spy for the Confederacy, has been hired by the Pinkerton Agency. Boyd's job is to make sure that Hainey does not stop the dirigible Clementine (the stolen Free Crow) from finishing its mission, but neither Boyd or Hainey knows exactly what the ship has been commissioned to do. Clementine is a quick read at just under 200 pages. Super fun stuff. Lots of action, dirigibles, shootouts on dirigibles. Belle Boyd is a fabulous character and I loved the addition of the Pinkertons. Mondays are always the worst, aren't they? Fortunately, I feel better than I have in the past two weeks. Colds are such a sucky double whammy considering they hit you in the head first and then move on to your chest. And if you're anything like me, that means they take up residence for an abnormally long amount of time, defying every over the counter syrup, powder, lozenge, and supplement you can find. Yeah. Seems to be moving out now, but it always requires extreme patience on my part. I just finished Deanna Raybourn's latest Lady Julia Grey mystery, Dark Road to Darjeeling, a luscious indulgence that can make anyone forget their woes. In this fourth of the series, the newlyweds are enjoying their honeymoon when fellow Marches Plum and Portia arrive. Seems Portia's ex, Jane, has been widowed in the final months of her pregnancy and now fears for her life. Her husband, Freddie Cavendish, died suddenly, but the death was deemed a terrible accident. Jane thinks that someone may have their eye on the Cavendish estate, a successful tea plantation in India. If Jane gives birth to a son, he would inherit, making Jane and her unborn a target for whoever may have killed Freddie. Brisbane agrees to investigate and Julia is eager to prove her usefulness as a parter in the practice, causing a bit of an argument between the couple. Ah, Julia and Brisbane. One of my favorite fiction couples. I love seeing how they progress as characters together. I do have to admit that some of the gothic atmosphere I love about Raybourn's books was missing in this one. Otherwise, a fun Victorian mystery and a wonderful addition to this ongoing series. It's time for another installment in the Shifters series! Can you see me jumping for joy? According to Rachel Vincent's website, it's the last one in the series, *sniff* that makes me sad. OMG! I can't wait! I'm so excited I have to type things like OMG! Ok, even I have to admit that's a super cheesy title for a blog post. I can't help it. I'm kind of cheesy and unoriginal sometimes. Anywho. I mentioned I'd been reading some teen titles lately. Kirsten Miller's The Eternal Ones was promoted as part of the Breathless Reads campaign along with Brenna Yovanoff's The Replacement. The two couldn't be more different, but it shows what an amazing selection is coming out for teens these days. The Eternal Ones is a tale of love, revenge, murder, and reincarnation. Haven Moore was raised by her strict religious grandmother, a woman who has had a strong hold on Haven and her mother since Haven's father died years ago. Haven has always had visions and those visions have set her apart in her hometown. Even her own grandmother insists the visions are the result of some illness or even possession, a view shared by many of the small minded folks around her. All Haven knows is that when she sees Constance and Ethan, she sees them as Constance would have -- through her eyes. When she stumbles upon the Ouroboros Society website, Haven becomes convinced that the visions could be memories of a past life. And when she sees Iain Moore on television, she is sure that he is connected. I love the idea of soulmates struggling to find one another through the ages. Constance and Ethan's backstories were one of my favorite things about this book. I did want more of the Ouroborus Society, but... I can't ruin this for you. At times I have to admit that I felt a little old for this book. I think if I were my sisters' ages I would have gobble this book up in one sitting. I wonder what Miller will be up to next, though. A return to Snope City and more of a certain girl with the sight would be interesting. Jackie at Literary Escapism has a fantastic interview with Jennifer Estep up right now AND she's offering a chance to snag a copy of Estep's latest in the Elemental Assassin series, Venom. You may remember I reviewed Spider's Bite here just a few weeks ago. It was super fun and I can't wait to continue the series (broke my streak and headed to the bookstore this past weekend to buy Web of Lies!). I've probably said it numerous times here, but I couldn't be happier with the current boom in teen books. Well, I guess I would be happier if I was a teen. There really wasn't that much selection back when I was in school. Fortunately for the Junior Junkies, they have a big sister who's addicted to books and peruses all of the various fiction sections, so they get all the new releases that strike my fancy -- the ones I read and the ones I just think they'll like. Yovanoff's teen debut is a dark and creepy read that, in my opinion, should have sort of an all ages appeal (older teens and up). Mackie has always been different and in the tiny town of Gentry, different is never a good thing. In Gentry, folks hang horseshoes over their doors and shears over their babies' beds. But every once in a while, a child disappears and is replaced by something different. Something that resembles the child, until you look closer. Mackie is one of those other children. But Mackie survived longer than expected. Now he lives in fear of iron and poisoned by the world around him. Until he is introduced to more of his kind. I really enjoyed Yovanoff's twisting of fairy tales and folklore and her imagery is utterly amazing. Perhaps it was the Nyquil, but I don't think so. Yovanoff's descriptions really made my imagination go wild. Little Cheshire Cat faced creepy kids. I get chills just thinking about it. Holy moly, folks! BN is offering Gemma Halliday's Scandal Sheet for free right now! If you do the eBook thing, now's your chance to give Halliday a go. Here's the link. I read this one when it was released last year and thought it was super fun. The second book in the series, The Perfect Shot is now out in e format as well. You can read my post on Scandal Sheet here to see if you're interested, but how can you pass up a free book? Want more of Halliday? Check her out every week on the Killer Fiction blog (one of my favorite spots for a daily dose of laughs). Are you ready? It's almost here! The follow-up to Guillermo del Toro and Chuck Hogan's The Strain hits shelves on September 21! The vampiric virus unleashed in The Strain has taken over New York City. It is spreading and soon will envelop the globe. Amid the chaos, Eph Goodweather—head of the Centers for Disease Control's team—leads a band out to stop these bloodthirsty monsters. But it may be too late. Ignited by the Master's horrific plan, a war erupts between Old and New World vampires, each vying for control. At the center of the conflict lies a book, an ancient text that contains the vampires' entire history . . . and their darkest secrets. Whoever finds the book can control the outcome of the war and, ultimately, the fate of us all. And it is between these warring forces that humans—powerless and vulnerable—find themselves no longer the consumers but the consumed. Though Eph understands the vampiric plague better than anyone, even he cannot protect those he loves. His ex-wife, Kelly, has been transformed into a bloodcrazed creature of the night, and now she stalks the city looking for her chance to reclaim her Dear One: Zack, Eph's young son. With the future of humankind in the balance, Eph and his team, guided by the brilliant former professor and Holocaust survivor Abraham Setrakian and exterminator Vasiliy Fet and joined by a crew of ragtag gangsters, must combat a terror whose ultimate plan is more terrible than anyone has imagined—a fate worse than annihilation. The book officially hits shelves in two weeks, but you can preorder now! Have you seen this symbol on bookshelves? If not, you should definitely be looking for it. 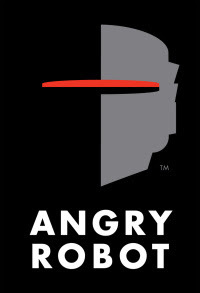 Angry Robot Books is a UK based publisher publishing sci-fi, horror, fantasy, and everything else you can think of between those genres. These titles run the gamut from horror to urban fantasy, so truly something for everyone on this list! New titles are due out each month and include series titles as well as stand alones. I'll have more on some of the titles later. Slights has been confounding me and Sixty-One Nails is rumored to be Neverwhere for grown ups! Oh, the long holiday weekend is upon us. What is everyone up to? I'll be heading home for a shower (haha, just realized how that sounded!) and some time with my family. I've been looking forward to it for over a month now. I've been trying to decide what books to bring. I mean, it's only the weekend, but I'm flying out tomorrow and back on Tuesday, which means I definitely need something to read in the airport/on the plane. I just can't make up my mind! Ah well. I'd meant to make this a whole post, but I've run out of time. My absolute favorite sisters bought me Vampire Weekend tickets for tonight! And then I get to go see them tomorrow! I think that warrants a few more exclamation points!!!! Alrighty. I'm off. See you guys on Tuesday!